Advertising on TekGuide.net has never been easier. As the Internet’s IT directory we provide you, the advertiser, with an audience that is specifically targeted to your product. For information on demographics, please fill out the contact form below. 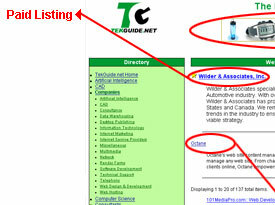 TekGuide.net experts know the Internet and work with clients to achieve high levels of campaign success. In addition to the 5 types of listings illustrated below every campaign is treated individually with creativity and flexibility to ensure that advertisers are meeting their objectives. To add your URL to our directory - click here. If you would like to learn more about TekGuide.net advertising opportunities, please contact AJ McDowell at (416) 499-8351.